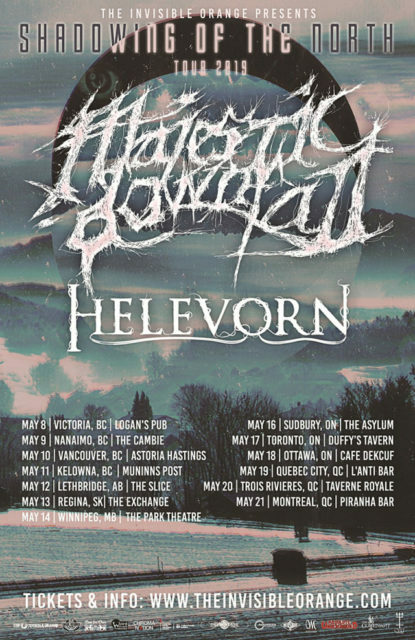 Just when spring begins to peak in the Great White North, Majestic Downfall (Mexico) and Helevorn (Spain) will arrive from warmer lands to plunge the country back into the cold and dreary atmosphere that Canadians are accustomed to with their individual styles of melodic and melancholic doom metal. Both bands have released impressive albums recently that have caught the attention of media around the world. 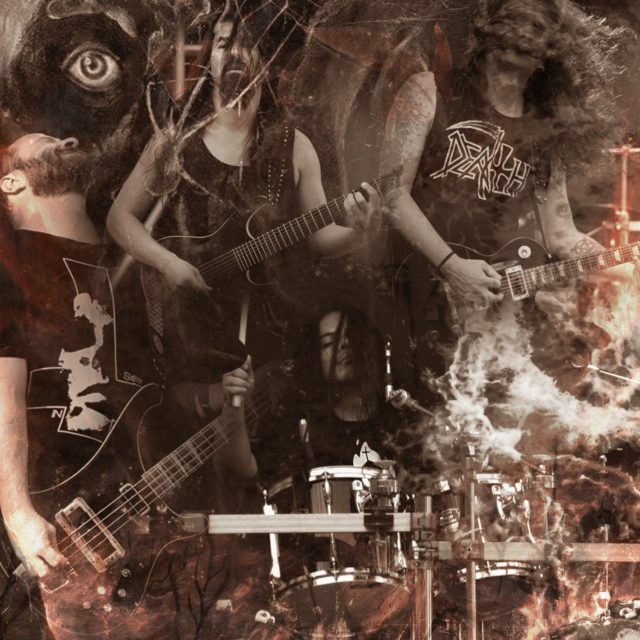 Now, Canadian metalheads will have the chance to experience the live acts from these well-regarded bands when they stop in Kelowna on May 11th at Muninn’s Post. Helevorn released “Aamamata” in January 2019 and following in the veins of Draconican and Swallow the Sun. Heavy and dreary, it has enough variation and self-expression to keep from being dull. Majestic Downfall unleashed “Waters of Fate” in December of 2018 and the six-track album is recommended for fans of My Dying Bride and old Katatonia. As their fifth studio release, they bring finesse and emotion back into the genre. Doom and death metal fans are invited to witness these acts across the desolate North. Majestic Downfall started as a one-man doom journey in August of 2006. The idea was to recapture the feeling of the 90s European death/doom metal scene, while mixing it with some more modern metal overtones. In 2007, MAjestic Downfall pressed its first demo titled – “The First Abyss Demo 2007” which was later released in a split with Italian black/doom metal band Ansia. On April 6th, 2009, Majestic Downfall released its debut full-length album, “Temple of Guilt”. This time the music contained a darker edge full of sorrow and new influences from bands like Shining and Forgotten Tomb. 2011 saw the release of “The Blood Dance” album which contained 7 sorrowful passages with an even darker edge than Temple of Guilt. The “Three” album was released in 2013 and this time the sound contained even more experimentation in the music but without staying too far away from the band’s musical roots. 2015 sees the release of “…When Dead”, an album that is not only the bands most diverse output incorporating lots of influences outside doom metal, but one that also and for the first time has an important backing label. In 2018, “Waters of Fate”, was released in 3 different continents by 3 different labels. It is mixed and mastered by Tore Stjerna (Watain, Portrait, Mayhem) at Necromorbus Studios in Stockholm, Sweden and definitely more and more opportunities in all areas coming along the way for the band. In 2006 they were asked to contribute to the Katatonia tribute “December Songs” and released the second studio album in 2009 “Forthcoming Displeasures”. This release saw their musical style evolve into a more intense and heavy sound, more forceful and deep. “Compassion Forlorn” was released in 2014, and was accompanied by a music video for “Burden Me”. The fourth studio album “Aamamata” was released on January 23, 2019. Vinyl and CD order of “Aamamata” on HELEVORN’s online store here and Solitude Productions here. That’s something to look forward to – are the tickets on sale yet? And how come Lethbridge but not Calgary?